The Royal Navy is dropping anchor in the north-east of England to take part in two of the region's biggest events. Three warships, HMS Invincible, HMS Leeds Castle and HMS Grimsby will be joining in celebrations on the Tyne for the Tall Ships Race. And the public will be able to visit helicopters and see marines in action at the Sunderland International Airshow at the end of the month. HMS Invincible, moored at North Shields, opens its doors on Saturday. On Tuesday and Wednesday, there will be a team of navy instructors juggling with swing clubs and dancing the hornpipe at Spillers Wharf. 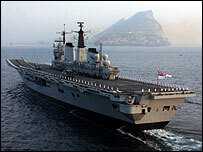 The warships will lead the flotilla out to sea as it sails on Thursday morning. Visitors to the Sunderland International Airshow on 30 and 31 July will be able to take a closer look at a Sea King and a Black Cat Lynx Helicopter, handle Royal Marines' weapons and sit inside the cockpit of a Sea Harrier fighter. A Royal Navy recruitment team will be present at both events. Lt David Concarr, North East recruitment officer for the Royal Navy, said: "The Tall Ships Race and Sunderland International Air Show promise to be the biggest events of the year in the region and we're delighted to be a part of them."